1. Can we get in touch with other couples that have hired your marquees? 2. Is it possible to see one of your marquees while it is erect? Seeing a marquee standing up will give you a clearer idea of what you want it to look like on your wedding day, as well as how it will look in the photos! 3. What size marquee should we have for our number of guests? Don’t forget that in addition to fitting in the tables, you will also need to think about space for the dance floor. For example, 110 guests would need a 20×60 ft marquee (including the dance floor). 4.Can you visit our suggested location and see if it is suitable for a marquee? A professional should not only be willing but should want to assess the ground beforehand and if they don’t, seek someone who will! 5. Can you talk us through the different shapes, sizes and arrangements that could fit in our space for our number of people? 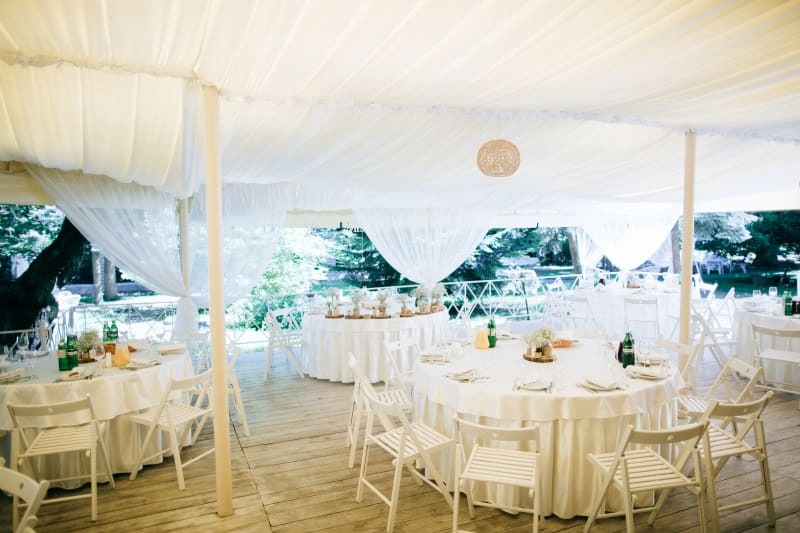 Whether you want square or round tables, or if you want to include a lounge area for your guests, your marquee provider should give you specifications and choices for whatever it is you want. 6. When will you assemble and dismantle the marquee? Normally the process will take a few days, so make sure you know exactly how long each stage will take and when you can start decorating the marquee to suit your theme. 7. Do you supply any of the furniture, like tables and chairs? Can we see the items, or pictures at least? If you choose some of the providers’ furniture, make sure to get this in writing to avoid any surprises come W-Day. 8. Can your marquee be opened up if it’s hot? Can the marquee be closed up and storm-proofed if there is bad weather outside? And will you provide heaters? We strongly advise you to prepare for any weather to make sure your guests are comfortable and having fun, you won’t want them escaping the dance floor for some air or huddling for heat! 9. Will we need an electrical generator? Can you provide this or recommend a provider? You might need a generator for your band and/or DJ and any other electrical supplies, like ovens/freezers for your caterers. 10. How will the marquee be lit? Can candles be used? If you want a romantic candlelit reception, make sure the marquee you choose allows open flames inside! 11. Do you provide the bathrooms? Ideally, you would also want a separate bathroom for the bride, so that she isn’t left queueing! 12. Will there be lasting damage to the ground or underground cables? Marquees can sometimes be damaging to certain surfaces, be careful you’re not left footing the bill! This is important to ask in case the marquee you have selected does end up damaging something! You don’t want to be liable!